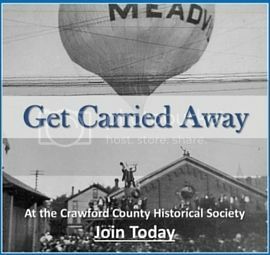 Academics, teachers, students, local history enthusiasts, genealogists, preservationists, civic leaders, area businesses, former residents, families, and the just plain curious–membership in the Crawford County Historical Society is for everyone with an interest in the rich history of Crawford County, Pennsylvania. Society members are part of a community, a community that extends beyond geographical borders thanks to the Internet and social media. Membership benefits include backstage tours, discounts, newsletters, research access, and more. Review the categories listed below and complete a secure, online application at the end of the page. Don’t live in the area or like to travel? Join at the Family level or higher and receive FREE membership in the North American Reciprocal Museum Association! Take advantage of an affiliation of 800 arts, cultural, and historical institutions along with botanical gardens, children’s museums, science and technology centers and more! See a complete list of locations across the country on this interactive map. Fill out the below secure form and follow the instructions. Once your information is received and payment has been processed, a membership card will be sent to you via the mail in 6 to 8 weeks. After clicking “STEP 1 SUBMIT INFO” the form will reset. Click on STEP 2 below to process payment. You MUST submit payment to complete the membership process. If we do not receive payment, your membership will not be processed. A confirmation email confirming your application will also be sent to your email inbox. Please check your spam folder if you don’t see the email.